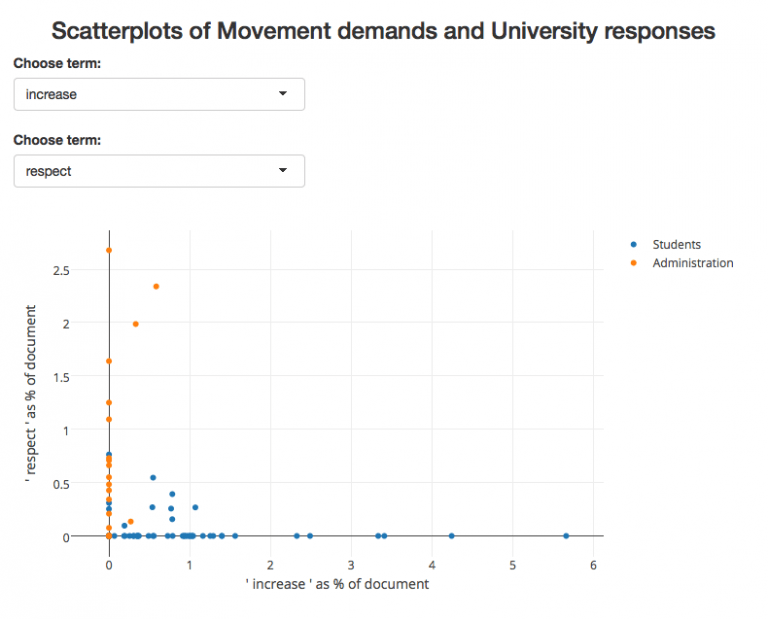 Over the last year Dr. Mark Ravina and history major TJ Greer have collaborated on a digital humanities project examining the rhetoric of student activism and university administration responses through text mining. The project was recently profiled by the editors of the website Digital Humanities Now, where the study’s findings will appear in a series of blog posts. Read an excerpt from their first post below (“Mining the Movement: Some DH perspectives on student activism”) and check out the full run here. This first blog reflects our first preliminary results, but even at this early stage we feel comfortable with two declarations: one empirical and one political. The empirical observation is that university administrations are largely talking past students, employing a radically different vocabulary than that of student demands. Our political observation is that universities need to address student demands seriously and directly, even if that means admitting that some problems are deeply structural and that solutions will require decades rather than months or years. 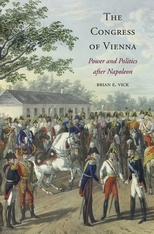 Professor Brian Vick, Associate Professor of History, published The Congress of Vienna, Power and Politics after Napoleon with Harvard University Press in 2014. The internet network H-Diplo recently selected Vick’s monograph for a multi-review roundtable and a response from the author. One of the reviewers, Jonathan Sperber (University of Missouri), praises Vick’s extensive use of primary sources and original approach. Sperber asserts that The Congress of Vienna for offers “a striking reinterpretation of the Congress, the practice of diplomacy and the political culture of post-Napoleonic Europe, which substantially enhances our understanding of the era while opening new possibilities for historical investigation and provoking scholarly debate.” Read the full set of reviews and Vick’s response here. Retiring Samuel Candler Dobbs Professor of American History, Dr. Jim Roark, will be honored with a scholarship for undergraduate research bearing his name. The Roark Prize will support rising seniors in the History Department pursuing research in the United States relating to their honors thesis. 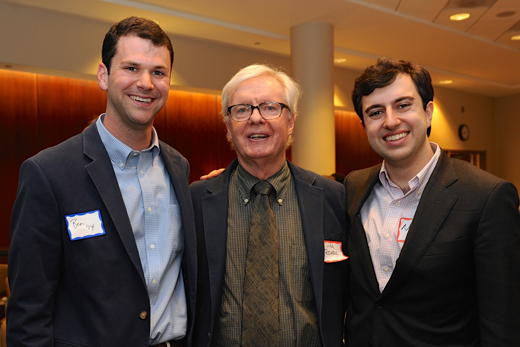 The idea for the prize originated with two former history students, Ben Leiner (’14) and Naveed Amalfard (’14), who counted Roark as an inspiring mentor and professor. Read the Emory News Center’s full report on the prize here. Reuben Lack, graduate of the Class of 2016, has released a science-fiction webseries called EPSILON. The story focuses on a world with various forms of artificial intelligence and its impact on humanity. With the collapse of food and habitable spaces for citizenry, people are forced within one of three refuges for protection. Each refuge relies on androids to help maintain security and protect against outsiders. The cities’ political dynamics are based off of several political theories, most notably Plato’s vision in the Republic of a philosopher-king and ‘Guardian’ protectors. If you’re interested in watching the first episode of the webseries or supporting the Patreon campaign for the project, please visit the project page here.